Once per turn, during your Main Phase, you can declare a Level from 1 to 8 to activate this card's effect. Until the End Phase, the Level of this card becomes the declared Level. You can only control .. Cannot be Normal Summoned or Set. Must first be Special Summoned (from the hand) in face-up Defense Position, by banishing "Crashbug X", "Crashbug Y", and "Crashbug Z" from your Graveyard. Switch the ..
During your Main Phase, you can activate this card's effect. Until the End Phase, this card gains 400 ATK, and its Level is increased by 1. This effect can only be activated once while this card is fa.. When the effect of a "Wind-Up" monster activates, except "Wind-Up Magician", you can Special Summon 1 Level 4 or lower "Wind-Up" monster from your Deck. This effect can only be activated once while th.. If this card attacks a Defense Position monster, inflict piercing Battle Damage to your opponent. 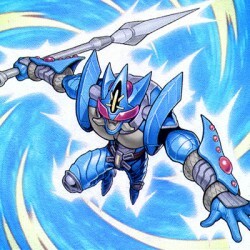 At the end of the Battle Phase, if this card inflicted Battle Damage to your opponent: Banish this car..
Once per turn, you can banish 1 Fish, Sea Serpent, or Aqua-Type monster from your hand to target 1 face-up card your opponent controls; destroy that target, then banish this card until your next Stand.. When a face-up Fish-Type, Sea Serpent, or Aqua-Type monster(s) you control is banished: You can Special Summon this card from your hand or Graveyard. (The banished monster(s) must be Fish, Sea Serpent.. When this card is Special Summoned: Target 1 face-up card you opponent controls; banish that target. When this card leaves the field: Set the card that was banished by this effect to your opponent's s..
During your Main Phase: You can return this face-up card on the field to the hand. During damage calculation, if this card attacked or was attacked: You can send 1 Normal Monster from your hand to the..